I asked the warden to let me see you. “No,” he says, just like that. So I asked to write you a letter, and all he gives me is this tiny scrap to write it on. He is a cruel man. A hard man. But there’s no room for those words here. I’m to be killed today – you know that – and there’s things I’d say to you before it’s done. I’m sure though, now that I start, that this’ll never reach you. The warden’s like to stuff it in my pocket and bury it with me. This story is my attempt at Madison Woods’ Flash Friday prompt (the picture, from her blog, is the prompt). Check out the other stories (including Madison’s) and submit your own on her message board! I like the premise of your story. It’s a rough and tumble look inside the mind of a man who did who knows what…and is going to pay for it. Yet, he still has a human side that the warden intends to stifle to the very end. Thank you for sharing – and joining the fictioneers! Thanks for commenting Susan! I’m already looking forward to doing it again next week. Love it…Its dark that he only has that small space but is so consumed with anger he doesnt write anything about love or plead innocence just hatred for the man who has him trapped behind the barbed wire. Well, he was right wasn’t he? A different take on the theme – nicely done. Thanks Sandra, and wow! Really enjoyed how your story turned at the end, the voice of the narrator — just a nice dense piece all around. Dark! Liked your take on the prompt. Very different! If you don’t mind my saying so… I am wondering about the tenses used here. Since I mess them big time myself, I always notice them while reading. I think it ought to be uniform throughout while I see it oscillating between past and present here at some places? Hi Parul, and thanks! You’re right about the tenses, but I did that deliberately, trying to write it as this man would write it in his letter. Nice job on yours by the way — I like the metaphor you use, and how your characters are responsible for the barbed wire that holds them back. Very cool! Oh, makes sense then. I didn’t see it like that before. Sorry about that! Thanks! And I love the confusion of your character in your story – the way captor / prisoner has been reversed and he doesn’t quite realize it yet. Can’t wait until next time! Hi Pinion! Welcome to the fictioneers! I enjoyed your opening salve and I can’t wait to read more next week. for my part, I liked the voice, complete with tense erratic-ness (is that even a word?) and a dark-seated hatred for the warden that overcomes even love for his sweetheart. If I had one suggestion it would be to slightly lengthen the last sentence. For example, I would have “He’s a hateful son of -“. If you’re keen to stick to 100 words, you could earn the extra two with “he’s” instead of “he is” in this sentence and the cruel man one. And a great suggestion at that — the last sentence was the hardest part for me, and I opted to keep his last words about the warden as open as possible (the idea being to basically just leave the subject of the sentence and a verb) — but it would definitely have some more flavor your way. I really enjoyed your story by the way — a person haunted by the past? I couldn’t help but think of an old librarian of mine from elementary school who’d been in a concentration camp and had the memory of it with her all the time. Great writing. I’m glad you liked the suggestion – there’s certainly nothing wrong with the way you have it – it made my mind go this way anyway, so my addition may just be overkill. And I hope you’ll forgive an addicted critiquer – I find crits so useful in my own writing I always try to give them when I can, but you are *very* welcome to ignore me, or indeed to tell me you don’t like being critiqued if you prefer. Pleased you liked mine too – I was wondering about a past soul, but either way this is a person haunted by history. I find it incredible to meet survivors of great traumas – you were very lucky to know someone like that in your childhood. I think it helps to remind us not just how lucky we are, but how resilient the human spirit can be. Welcome to Friday Fictioners. I enjoyed your piece and look forward to reading more from you. Thanks for the nice comment on mine. Thanks Russell — I’m looking forward to next week and the next prompt! Great read, Brian. 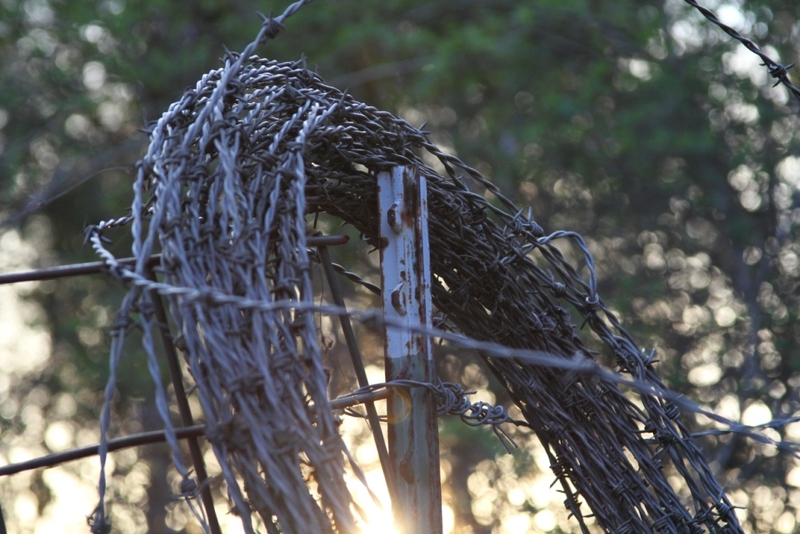 The barbed wire immediately made me think of a darker story line, and you delivered it. So glad you joined Friday Fictioneers. Your post today makes me eager to read more of your work. Very nicely done–I even felt a twinge of sympathy for the condemned man. Thanks for the comment and the welcome! Yours really created a good frontier atmosphere – felt really authentic. Thanks! Welcome to Friday Fictioneers. This is an intriguing story. I like the POV you took, and in so few words I “see” that hateful warden. Good job. Thanks — and great job on yours, connecting the image of the men in the barbed wire to cattle. Can’t wait for next week already! Prison — smart. And it totally didn’t enter my mind when I looked at the photo. Good job! Too bad, since I was looking forward to what he had to say. Great job! I liked this a lot. The simple “I’m to be killed today – you know that – and there’s things I’d say to you before it’s done” is really good. No sentimentality-just statement of fact. Great story, Brian. Love the voice of your character and how he/she holds on to anger until the very end. That was a truly original take on the prompt. For your first time you did great. I’m sad that your character never got to say what he wanted to say though. Such wasted space to spend complaining.I sort of feel for the intended recipient. Thanks for commenting on mine. I’ll take those few words! Thanks! You are a welcome voice to the group. Well told story in a few words. I felt for him. Great use of the prompt to show the inner torment of a man who wants to get his last message across. Also the idea of just having a scrap of paper to write on, for whatever reason, effectively fills me with horror! Good use of a ‘cut off’ sentence, too. Poignant and raises a lot of sympathy. Thanks, I appreciate the comment! Your story was very visceral — I could really feel the torment as I was ‘watching’ it. And the mysterious ritual raises so many questions that I wish I could read on.